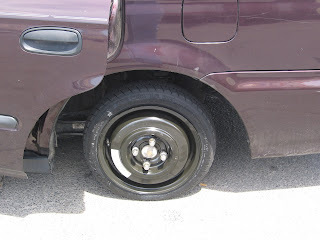 Ferdie's Funhouse: The Blessings From a Flat Tire! The Blessings From a Flat Tire! Yes, as you can see from the Montana post, my little baby Gina K. got a flat on our Montana journey! And by flat, I don't mean I ran over a nail in the road and put a small hole in the tire, no, I mean one of the tires basically just started ripping at the seams and almost exploded. I can't say I'm surprised, as her two front tires were both bald as an eagle. In fact, I had been planning on having to replace them 7 months previous (yeah, they'd been bad for quite some time) when I took it in to do the safety and emissions test to get Gina registered, but luckily they slipped by the "thorough" Jiffy Lube check and I was back on the road with the plan to drive them until they couldn't go another mile! So anywho, we're driving along (aka I'm driving, and Alyssa is still in the semi-comatose state she went into the second we hit the freeway) and Gina, who had been pulling to the right for a couple of months, started REALLY pulling to the right, as well as making a not so pleasant sound. I get out to inspect, and sure enough, flat as can be. It's about 8:20 in the morning by this point, FREEZING cold outside with a nasty wind, and we're 10 miles outside of Dillon, which is only like 50 minutes to an hour from Stacy's. So close! I've never changed a flat in my life and neither has Lyss, and being in Montana, there were hardly any cars going by, so I whip out my phone to call my Dad to have him walk me through a tire change, and....no service. Review: bitter cold Montana morning, flat tire with no idea how to change it, no people in sight to ask for help, and no phone service to call anybody. Lyss and I both start praying our little hearts out, asking Heavenly Father to please let someone stop or to let one of us get service, and what happens? I get one bar! Granted, I can't be touching my phone at all or I lose it, so I have the phone on speaker, on the front of my car, leaning over to hear my Dad over the wind as he walks me through what to do. (He did offer to drive out and change it for us fyi, as my parents were at Stacy's visiting too, but that would've wasted a couple hours and I thought I could do it with some instruction) Just when he's finished explaining and I go to get the supplies to start testing my instruction following abilities, a truck pulls up and a nice lady (Yes, LADY--Montana women are tough!) changes it for us! (I watched her like a hawk though, so I'm pretty sure I could change a tire now if the situation arises.) We were able to then make it the rest of the way to Stacy's on the little spare and then get new tires once I was there! My point in elaborating on the story was just to share one of the tender mercies of our Heavenly Father. Too many times I think, I pass off as coincidence what are instead blessings from Heaven, and I can't say enough how grateful I am that prayers are answered, whether directly from above or through other people. I just hope that I can remember these experiences and work harder to be close to promptings of the Spirit, so that when others are in need, I can be the Lord's hand to help them like that lady was for us! I didn't take a picture of the spare on Gina, so here's a picture of a spare on my sister Steph's car when her tire blew as we were driving to Jackson Hole one time! They look so funny! What's With My Love For Cheesy Movies? Alone in the rain...and loving it!